← Where are the Gridlines? MoneyWorks allows you to clone a new document (data file) from your existing document. Reasons for cloning a new document could be due to setting up a new company and would like to use the same item list, name list, chart of account and users; or could be you have messed up the existing document and would like to create a new document with the similar setting (but without the transactions) to replace your existing document. How to clone a new empty document? From the File menu, you select “Save a Copy As” to clone a new empty document. In the “Save a Copy As” wizard, select “Save an Empty Clone” radio button and enter the “Balance Date” of your new document. Balance Date is the closing date set in your document to allow you to record the closing balances of your last financial year. For example, if your existing document’s financial year is from April to March, but your new document’s financial year is going to be from January to December, and you would like to start your company file in the year of 2012. 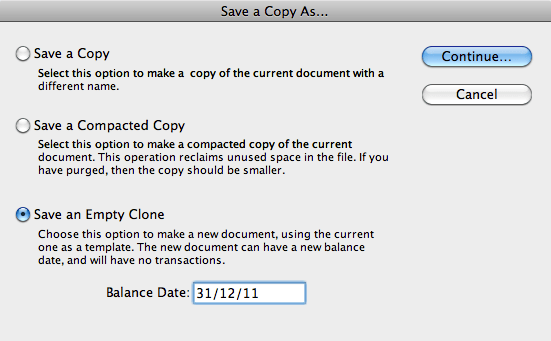 So, in this case, you enter the Balance Date as “31 December 2011”. MoneyWorks will create a period (December 2011) before your first financial year 2012 (from January to December) for you to record your closing balances. What if my new document is for my newly set up company, which does not need a closing balance, do I still need to set a closing date? Balance Date is a required field, which you need to enter. Although, your company is a newly setup company, you still need to have a “Balance Date” before your financial year. You may not enter anything in this “closing period”, but a “Balance Date” is still a must if you want to create a new document using “Empty Clone” method. Besides, MoneyWorks will create your first period of your financial year after the Balance Date. This entry was posted in MoneyWorks, MoneyWorks v6 and tagged accounting software, mac accounting software, MoneyWorks, Singapore, Small Business Accounting Software, software. Bookmark the permalink.